VeryPDF Image to Flipbook Converter is a powerful digital photo albums creator that enables you to create digital photo albums that look like real photo albums and complete with page-flipping action. With Image to FlipBook Converter, you can easily create an interactive flash flip photo album to share photos on your website. Image to Flipbook Converter does convert your favourite images/photos (.jpg, .bmp, .jpeg, png) with customizable style and amusing effect to Flipping books. 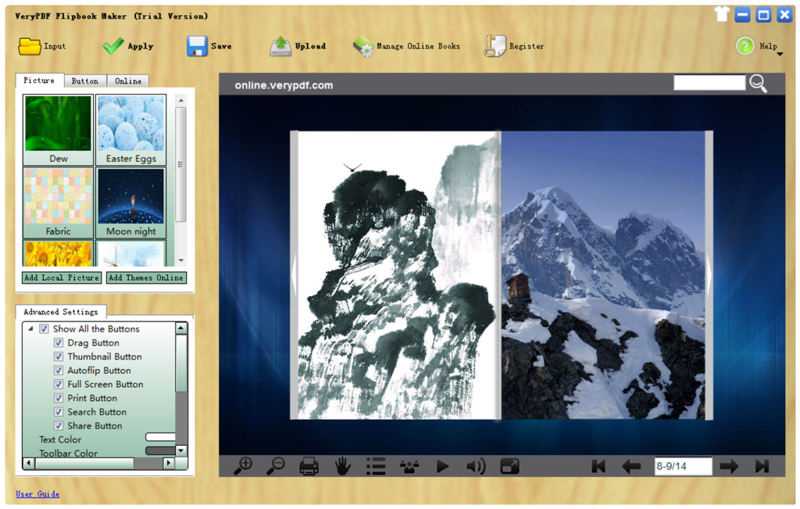 You can select to output your flipbook with multiple formats such as SWF/HTML/EXE/ZIP. Support Batch Convert image to Adobe Flash based photo album with the real page turning effect. Output to 4 different formats: HTML, EXE, Zip and APP. HTML format does allow you to upload to a website to be viewed online. EXE, Zip and APP are allow you to send to your user by email to be viewed on their computer offline. Choose multiple template for output flipping photo album. Converted Flipbook can be viewed on all mobile devices (iPhone, iPad, and Android devices). Customizable auto-play time for page-flipping. Able to preview the flip book and feel effect instantly. Set scale value for zoom-in function. Able to view output page-flipping eBook on iPad, iPhone and Android devices. Able to use buttons to control pages in Flipbook, such as Previous, Next, First, Last etc. Full screen mode to view page-flipping ebook. Use page thumbnail to navigate flip pages. Able to create High-quality photo books and photo flip books from Images. Create book-like photo albums with the real page turning effect. With Image to Flipbook Converter, you can create realistic digital books, textbooks, and other educational materials. The page-flipping effects make them as close as possible to their paper counterparts. And the ability to open your online book on any mobile device (iPhone, iPad, Android devices) means your books will be state-of-the-art and convenient to use. Thanks to Image to Flipbook Converter, you don’t need special programming skills to create modern and beautiful e-books that are easy to use. Image to Flipbook Converter does support lots of input formats, the source document for your e-book can be any format: PDF (all links and content will be automatically imported into the publication), Microsoft Office (DOC, DOCX, PPT, PPTX, XLS, XLSX), HTML, Photo (BMP, JPG, TIFF, PNG, PNG, PCX, TGA, GIF) and more. This entry was posted in Flipbook Maker and tagged flip book, flip book from image, flip book maker, image to flip book, image to flipbook, pdf to flip book. Bookmark the permalink.